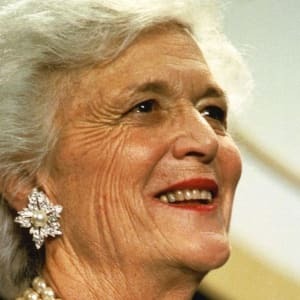 Barbara Bush — the only woman besides Abigail Adams to be both a wife and a mother to a president of the United States — was born in New York City on June 8, 1925. In 1945 she married George H.W. Bush, who became vice president in 1981 and president in 1989, the same year she started the Barbara Bush Foundation for Family Literacy. In 2001 her son George W. Bush was inaugurated president. 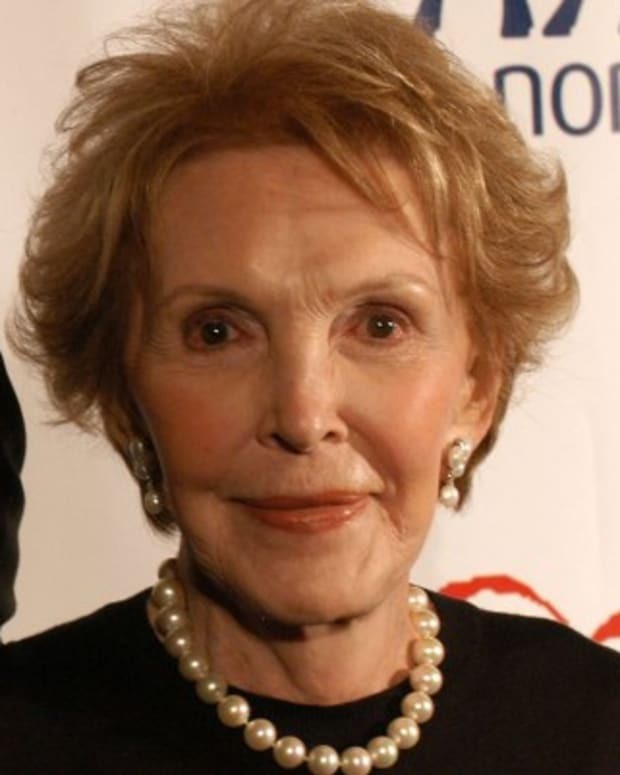 The former first lady passed away at her home in Houston, Texas, on April 17, 2018. Barbara Bush has an estimated net worth of $25 million, according to Celebrity Net Worth. Barbara Bush was born Barbara Pierce on June 8, 1925, in New York City. 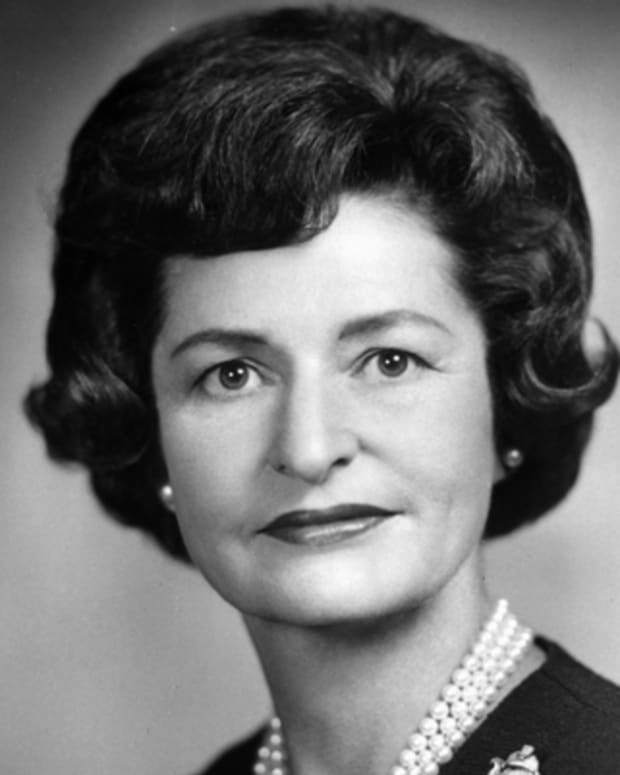 Her mother, Pauline Pierce, was the daughter of an Ohio Supreme Court justice and dedicated to conservation efforts as a chairwoman of the Garden Club of America. 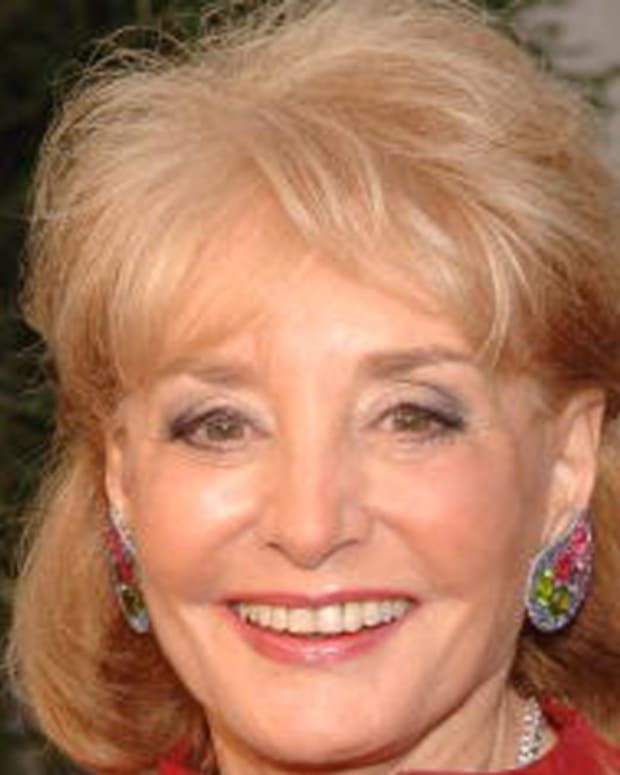 Her father, Marvin Pierce, was a distant descendant of 14th President of the United States Franklin Pierce and president of the McCall Corporation, which published the well-known magazines McCall’s and Redbook. 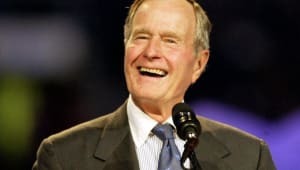 Growing up in an Episcopalian family in the bedroom community of Rye, New York, Bush was an athletic and witty child who loved — above all things — to read. 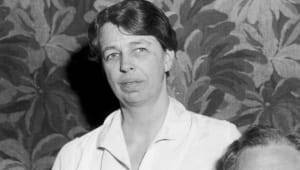 She received her primary education at Rye’s Milton Public School and Rye Country Day School before going off to Ashley Hall, a boarding school in Charleston, South Carolina, in 1940. In 1941 while at home from boarding school on Christmas break, 16-year-old Barbara met her future husband, George H.W. Bush, a 17-year-old senior at Phillips Academy in Andover, Massachusetts, at a dance. The pair saw little of each other as George finished high school and then served as the U.S. Navy’s youngest combat pilot in World War II, but they wrote faithfully. "Bar," as her friends and family had taken to calling her, dropped out of Smith College in 1944 following her freshman year. After a long-distance relationship and George’s brush with death after his plane was hit during a bombing run in the Pacific, the couple married in January 1945. After the end of World War II, the newlyweds moved to New Haven, Connecticut, where George enrolled as a freshman at Yale University. The couple&apos;s first child, the future President George Walker Bush, was born in 1946. George entered the oil business after his graduation from Yale in 1948 and moved the family to Texas and California. In September 1949, Barbara’s parents were involved in a car accident in which her mother was instantly killed. Since she was pregnant, Barbara was advised not to travel from California to the funeral, and the event left a lasting scar. 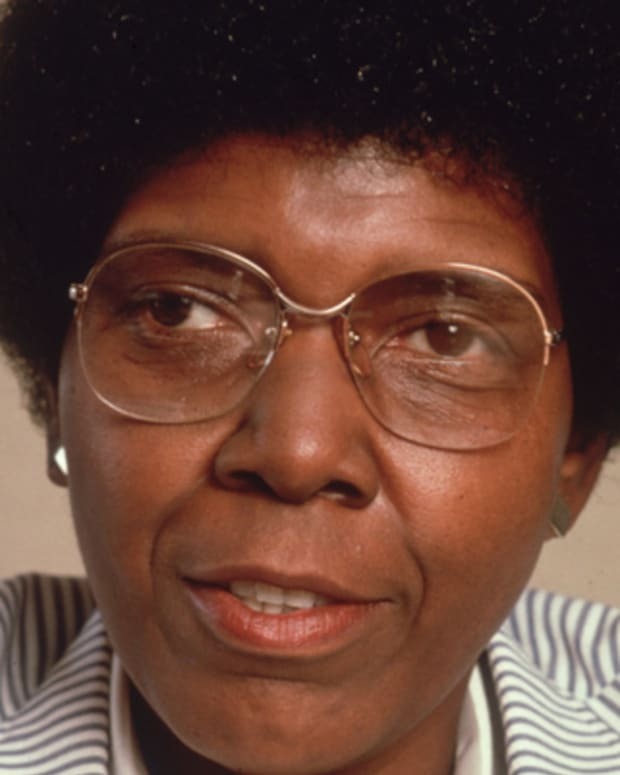 Three months later, the couple welcomed a second child, a daughter named Pauline Robinson Bush in honor of Barbara’s late mother. 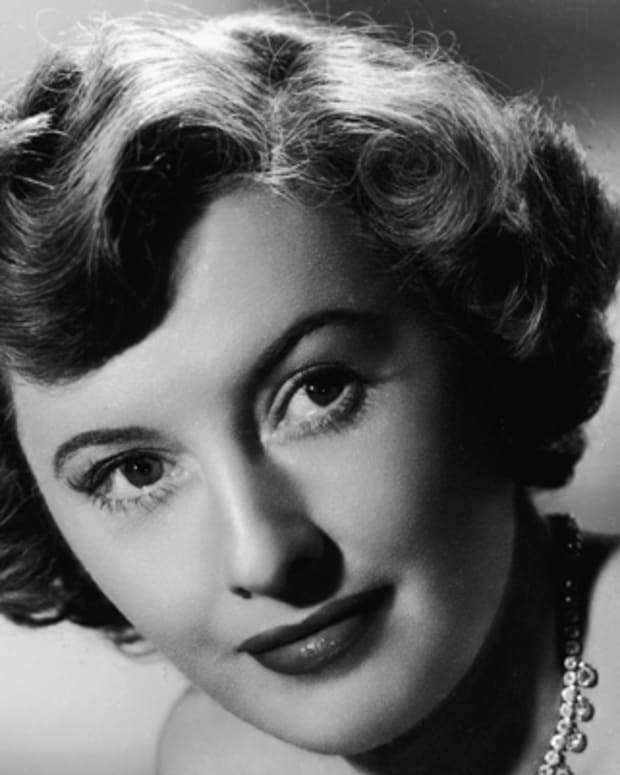 In October 1953, the child, nicknamed “Robin,” died of leukemia, leaving Barbara and her husband devastated. It was during this traumatic time that Barbara’s reddish-brown hair turned prematurely white. 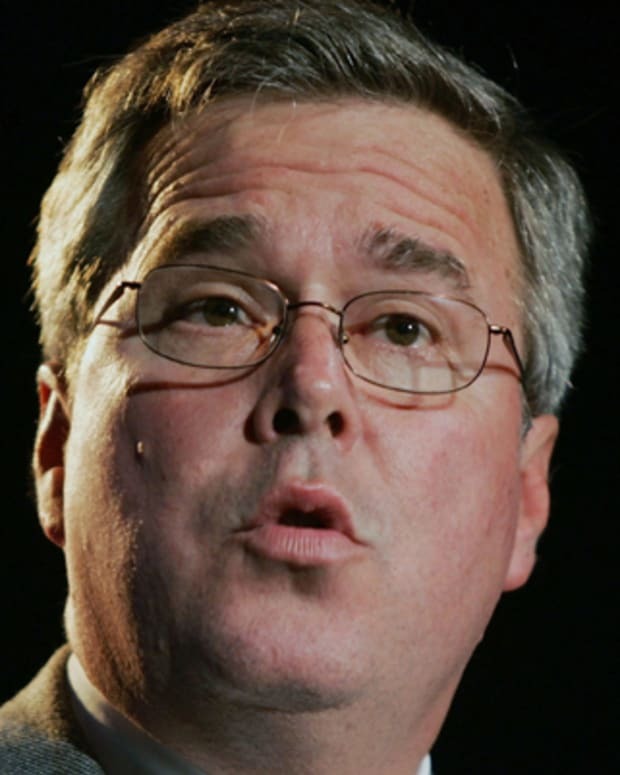 The couple’s third child, John Ellis "Jeb" Bush, had been born just prior to Robin&apos;s diagnosis. 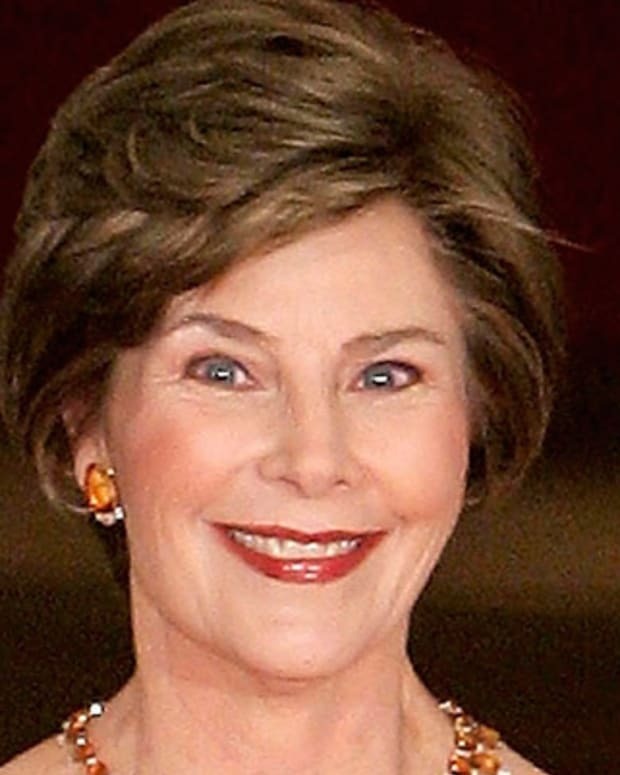 Barbara went on to have two more sons — Neil Mallon Bush in 1955 and Marvin Pierce Bush in 1956 — before giving birth to another daughter, Dorothy "Doro" Bush (named for George&apos;s mother), in August 1959. She spent the next two decades primarily dedicating her time to being a wife and mother, while volunteering for organizations such as the YMCA and United Way on the side. The couple eventually settled in Midland, Texas, where George found success in the petroleum industry. 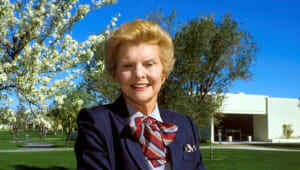 Barbara also helped her husband&apos;s budding career in Republican politics by participating in his campaigns. In 1966 her husband was elected to Congress for the first time, and the following year the Bush family moved to Washington, D.C. In 1970 President Richard Nixon asked George H.W. Bush to give up his seat in the House of Representatives and run for the U.S. Senate in Texas, where he lost to Lloyd Bentsen. After George successfully lobbied Nixon to appoint him U.S. ambassador to the United Nations, the family moved into New York City’s famous Waldorf Astoria Hotel. There, Barbara’s social ease and skill at entertaining made her popular with foreign dignitaries. In 1973 as the Watergate scandal gripped the country, Nixon asked George to leave his U.N. post and take over the Republican National Committee. Barbara grew concerned that defending the administration could damage her husband’s career. In August 1974, Nixon resigned in disgrace, and Gerald Ford took the reins as president. Given the pick of several diplomatic posts, George chose a position as chief of the U.S. Liaison Office in the People&apos;s Republic of China. Barbara traveled abroad for the first time when she joined her husband at his new post. In China, she immersed herself in the culture and studied the language, but the family’s stay there didn’t last long. In 1975 President Ford asked George to return and become director of the Central Intelligence Agency (CIA), which had been under fire for its involvement in Watergate and the Vietnam War. Barbara again grew concerned the position could hamper her husband’s future in politics. During George’s stint in the CIA, and with her children away at school, Barbara fell into a depression. She kept her condition to herself and did not seek medical care. However, the experience gave her a greater understanding and compassion for mental health issues. When George decided to make a run for the White House in 1979, Barbara was back on the campaign trail engaging with voters. 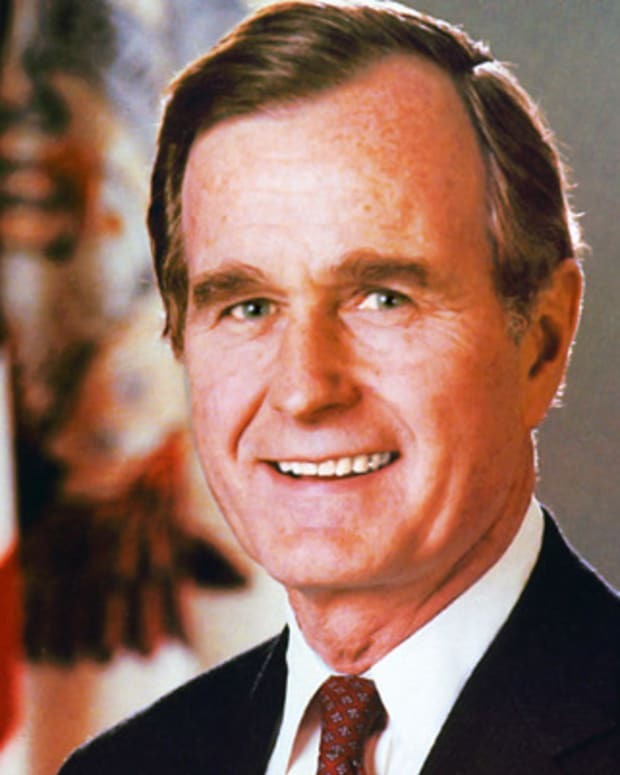 In the end, the Bush camp couldn’t overtake the momentum gained by Ronald Reagan, but the nominee chose George as his vice-presidential running mate on the Republican ticket that won a landslide victory in 1980. 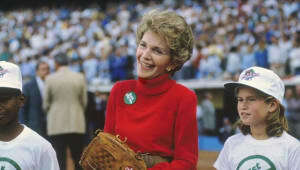 After rising through the political ranks, Barbara&apos;s husband became vice president under Ronald Reagan in January 1981. 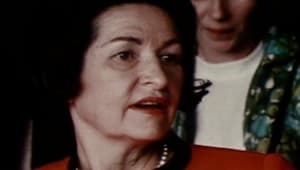 As wife of the vice president, Barbara logged hundreds of thousands of miles representing United States interests abroad, and she forged lasting friendships with foreign heads of state. Her popularity rose during this time, and, motivated in part by her son Neil’s dyslexia, she dedicated herself to supporting a cause that had always been near and dear to her heart: literacy. She set about educating herself on the issues of child and adult illiteracy, and became actively involved with several organizations advocating for the cause. After serving two terms as Reagan&apos;s vice president, George H.W. Bush embarked on a second run for the presidency. He ran a tough campaign, eventually defeating his Democratic opponent Michael Dukakis. 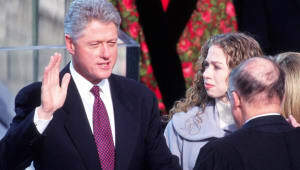 In January 1989, he was sworn in as the 41st president of the United States. As first lady, Barbara placed less emphasis on fashion than her predecessor, Nancy Reagan, even purchasing a pair of $29 shoes to wear to her husband’s inaugural ball. 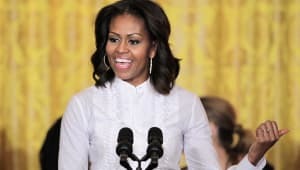 Known for wearing multiple strands of faux beads around her neck, the first lady turned to noted fashion designer Arnold Scaasi for much of her official wardrobe because he understood her practical style. The same year she moved into the White House, the first lady was diagnosed with Graves’ disease, a malfunction of the thyroid gland that made her eyes red and puffy. She went through radiation treatment to lessen the effects of the condition, but Barbara’s diagnosis failed to deter her commitment to public service. The first lady started her own literacy organization, the Barbara Bush Foundation for Family Literacy, which supports organizations across the United States that teach reading skills to both parents and children. She authored Millie&apos;s Book: As Dictated to Barbara Bush, a portrait of the White House as seen from her springer spaniel Millie’s point of view that raised nearly $1 million for literacy programs. The Bush years in the White House would see triumphant change in the world with the end of the Cold War, as well as ongoing international turmoil. In 1989 the United States invaded Panama and arrested dictator Manuel Noriega. 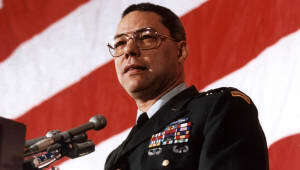 In August 1990, the president launched Operation Desert Shield and began to assemble a coalition of 34 countries to confront Iraq after its invasion of Kuwait. In November 1990, Barbara and George spent Thanksgiving in Saudi Arabia to visit the thousands of American troops serving in the operation. The Gulf War, launched in January 1991, was hailed as a victory for allied forces and the Bush administration. Barbara had seen her husband’s popularity and prospects for a second term soar as the troops came home to a warm welcome. In 1992, however, the country suffered an economic slump, and support for the Bush administration plummeted. Meanwhile a young Bill Clinton seemed to have captured the imagination of voters and momentum in the polls. That November, Clinton defeated the incumbent, and in January 1993, George and Barbara said goodbye to Washington and returned to Texas. After her White House years, Barbara redoubled her dedication to public service. 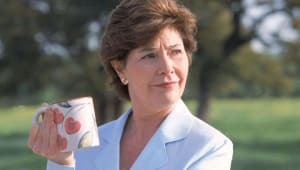 She continued her commitment to literacy projects, raising millions of dollars for the cause, but she was also able to spend more time with her family, which made a major political comeback in 1998 as George W. won his second term as governor of Texas and Jeb was elected governor of Florida. 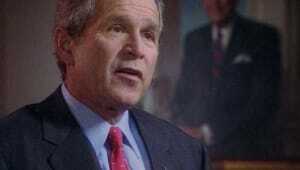 In 2000 George W. Bush followed in his father&apos;s footsteps and was elected president. 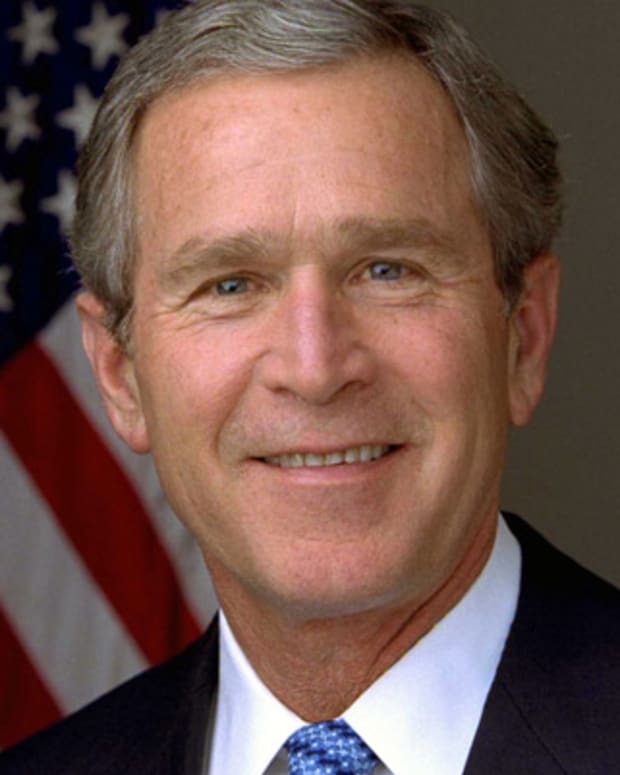 In 2004, he was re-elected for a second term. 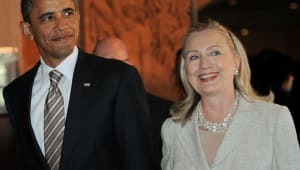 Barbara also provided support for Mitt Romney during his 2012 presidential campaign and for son Jeb Bush who announced a bid for the 2016 Republican presidential nomination. 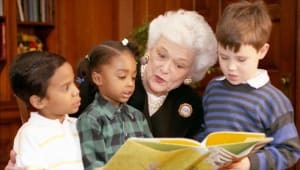 Residing with her husband in Houston, Texas, and at their summer home in Kennebunkport, Maine, the former first lady remained active in the Barbara Bush Foundation for Family Literacy while serving as an ambassador-at-large for AmeriCares. Barbara Bush had 17 grandchildren, including twins Barbara and Jenna (from George W. and Laura Bush); George, Noelle and John Ellis (from Jeb Bush); and Lauren (from Neil Bush). On January 14, 2017, Bush&apos;s husband, the former president, was hospitalized, suffering from "an acute respiratory problem stemming from pneumonia," according to a statement. Barbara was hospitalized just days later on January 18, after experiencing "fatigue and coughing, and was released on January 23. Her husband was discharged from the hospital a week later on January 30. Just days later, the resilient couple attended Super Bowl LI at NRG Stadium in their hometown of Houston. They were cheered on by the crowd when the former president performed the coin toss before the start of the game. 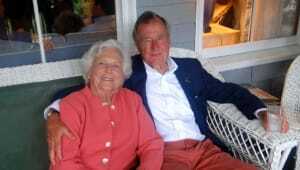 In the following months, Bush persisted through her battles with congestive heart failure and chronic obstructive pulmonary disease, but on April 15, 2018, her husband&apos;s office issued a statement that said she would no longer undergo medical treatment and instead remain at home with family to "focus on comfort care." "It will not surprise those who know her that Barbara Bush has been a rock in the face of her failing health, worrying not for herself — thanks to her abiding faith — but for others," the statement said. "She is surrounded by a family she adores, and appreciates the many kind messages and especially the prayers she is receiving." 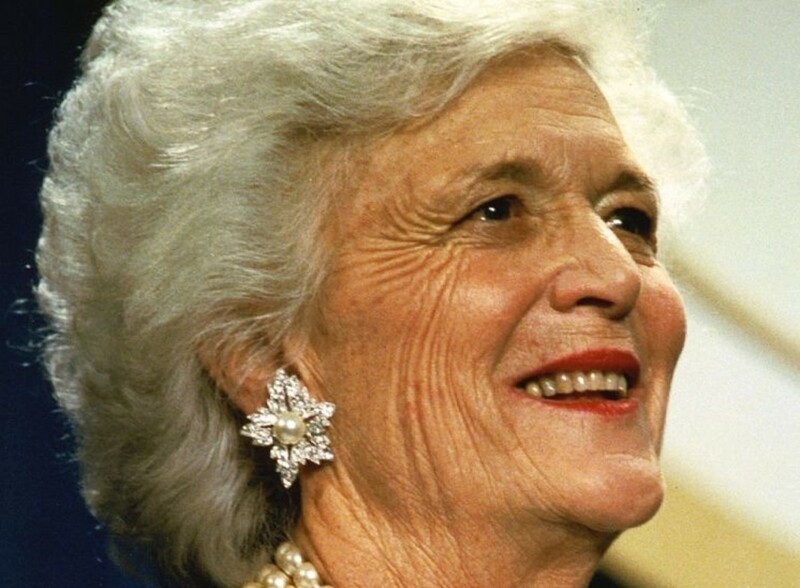 "Barbara Bush was a fabulous First Lady and a woman unlike any other who brought levity, love, and literacy to millions. To us, she was so much more. Mom kept us on our toes and kept us laughing until the end. I&apos;m a lucky man that Barbara Bush was my mother. Our family will miss her dearly, and we thank you all for your prayers and good wishes."